Shopping in Springbok Springbok is a lively shopping haven, a big attraction for locals and people from the surrounding small towns as well as for the Namakwalanders from Pofadder, Garies, Kleinzee, Port Nolloth and Alexander Bay, all within less than one and a half hours drive from Springbok. Herero and Ovambo people, indigenous to Namibia, trade their grass baskets and wooden handmade crafts in Springbok. We have a livelyhome industry where housewives, artists and crafts men sell their handmade confectionery and art work - a must to visit. Karlientjie and Jopie are the places not to be missed for gifts. In 1684 Nama and Khoisan people arrived at the Castle in the Cape of Good Hope to sell their bangles and bracelets. Simon van der Stel believed they come from the Monomatapa of Africa, and started expeditions to the most western corner of the Northern Cape Province. Today this area is called 'The Garden of the Gods' and is famous for the wondrous display of spring flowers that explode into bloom every August and September. Copper was discovered on the farm Melkboschkuil in 1850. In 1852 the farm was bought from Long Kowie Cloete by the mining company Phillips and King, which later become known as Cape Copper Company. The mine became the first commercial mine in South Africa, but was worked out by 1888. In 1863 the town Springbokfontein was mapped out by Mr Fletcher. Springbok was build around the copper mining industry. Climate in Springbok Springbok counts 300 days of sunshine and only 4 inches rain per year. Temperatures hardly ever exceed 30 centigrades in summer and seldom fall below 6 in winter. We have a hot and healthy climate with no malaria. Springbok is the Gateway to Namibia, only 120 km south of the Namibian border. Springbok is the ideal overnight stop, as it lies halfway between Cape Town and Windhoek. There are only small settlements further north with few facilities. 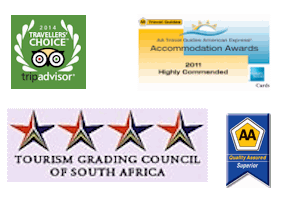 Springbok offers excellent hotels, guest houses, caravan parks, restaurants, supermarkets, service stations and an airport. Springbok today Today Springbok lies in a deep low plain between rugged mountains, about 600 km north of Cape Town. It is the commercial and cultural center of Namaqualand, located directly on the N7 which connects the Cape and the Namibian capital Windhoek. Springbok is a prosperous town with 15,000 inhabitants. The main income is generated from tourism, mining activities, commerce and farming.